Although everyone understands the concept of a generator, few know what to look for when they’re in the market. 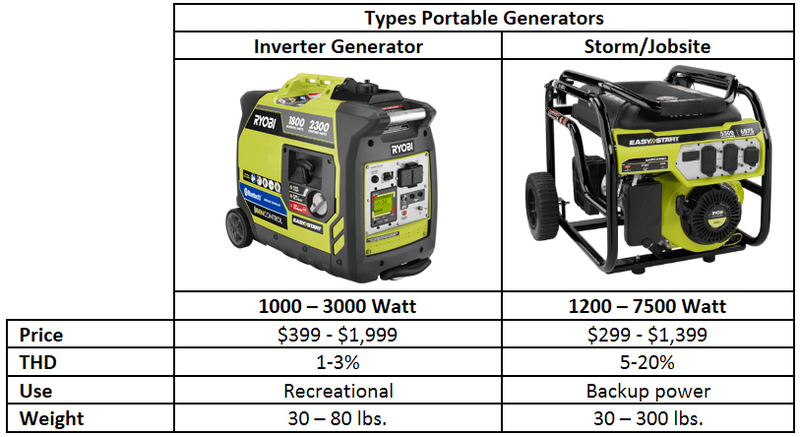 The guide below provides information on the types of generators and key things to look for before making a purchase. What’s the difference between an inverter and traditional generator? Although the difference between running and starting watts may seem obvious, the way it’s marketed may not always be clear. Running watts is the amount of power that can be produced continuously. Starting watts, also referred to as surge watts, is the additional power that can be temporarily produced for items that require more power to start than to run. Almost all inverter generators are marketed by their starting watts while traditional generators, with the exception of a few brands, are marketed by their running watts. Total Harmonic Distortion (THD) measures the quality of the electricity produced by the generator. High harmonic distortion can damage electronics. If you’re using your generator to power TVs, laptops, phones or other sensitive electronics, you should look for a generator that produces less than 10% THD. Most generators use Automatic Voltage Regulators (AVR) to protect against voltage spikes and deliver consistent voltage output under load. Quality of the AVR hardware can vary and it’s not always the best gauge of how clean or consistent the power output will be.